This home version of the original video arcade game will grant you the greatest sensation of movement and speed like no other game has before. So be prepared to feel every curve, dip and increase in speed as you try to race across this track. Five tracks in all with five separate goal lines. Your objective is to reach any one of the five goal lines to be considered a winner. And the decision is yours as to which track you'll travel. 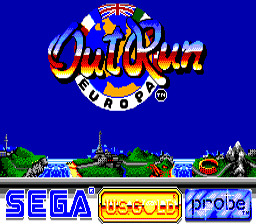 Now start your engine, grip your controls and get the lead start in the fastest race ever to reach your home. --From the Sega Master System Out Run instruction manual. 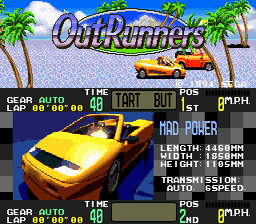 Get ready for a wild drive across every region imaginable. Reach the check points before time runs out to advance to the next stage - if you don't, you will be disqualified. But drive carefully! Watch for slower cars on the road and hazardous obstacles off the road. Stay alert or you will crash, seriously damaging your chances of setting a speed record. This is the most demanding car rally ever! Never has a race course had this range of terrain. Prove to the world that you are the master of the highways. 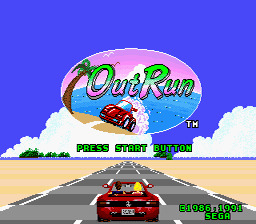 --From the Sega Genesis Outrun instruction manual. You step on the accelerator; your car's tires kick up a cloud of smoke and debris as they scrabble for a grip on the road's surface. The force of your acceleration shoves you deep into your seat and the walls of the surrounding tunnel become a blur. You switch out of low gear. Your car shoots out of the tunnel. There's a flash of blinding light before the windshield darkens to compensate. Above you can see a clear blue sky and the outlines of mountains in the distance. Get ready for the wildest drive of your life, 21st century style. Five incredible cross-country races take you through some of the most impressive sights--and the most treacherous roads--in the world. 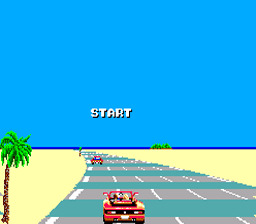 You'll travel at speeds that will test the limits of your skills, reflexes... and nerve. A sound racing strategy can also mean the difference between a disastrous crash and setting a new world speed record. Get behind the wheel, and prove that in 2019, you rule the road! 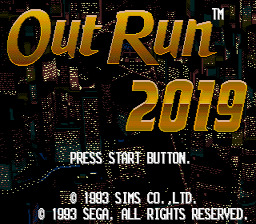 --From the Sega Genesis Outrun 2019 instruction manual.